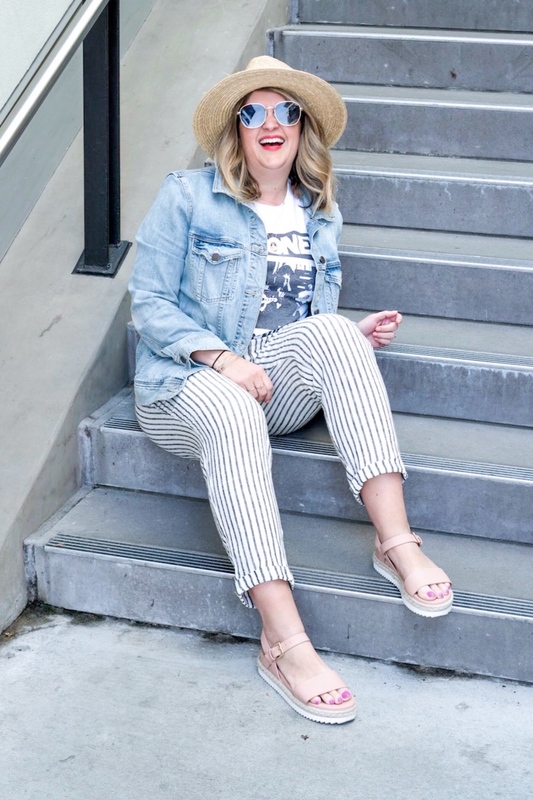 Cortney (of the Seattle blog, The Grey Edit) and I are once again teaming up to bring you two unique styles and two very different body types. For reference, Cortney is 24 weeks and a size 4, while I am 16 weeks and a size 10. If you are pregnant for the first time, or thinking about getting pregnant, you should still continue to buy your same size in dresses or tops, while pants are a bit different because you will get to a point where you won’t be able to button them anymore (I’m right in the thick of that right now). If you are buying maternity specific styles, I would actually size down as they tend to have a ton of stretch and come a little longer than normal to accommodate your growing belly. *Please take this with a grain of salt as every body is different, but this is my personal experience since I don’t grow a very large belly. What I love about this post is that it applies to everyone, whether you’re pregnant or not! So here you go, our non-maternity pregnancy style coming at ya! Market Bag is from Apolis. Okay, hands down my favorite purchase lately are these linen pants from Old Navy. What I love: they have an elastic waistband and they are forgiving around the thighs and behind (where I’ve recently become insecure since gaining some weight around those areas due to pregnancy cravings). This style of pant can be tricky because most of them have a wide leg and I’m only 5’5 so a heel is usually required (that is out of the question at this point). But these are different because they have a nice hem and slight taper at the bottom making them easy to style with any type of shoe. I styled them with a simple graphic tee and oversized jean jacket. Of course, I had to add in my favorite accessory: a hat (currently on sale for limited time only)! This dress is perfect for a baby shower, brunch and even comes in a longer version which would be perfect for a Spring or Summer wedding! I loved this dress so much I literally wore it out of the store (no joke). The best part? It’s only $24.99! This dress also comes in a maternity version which I’m also linking below in case you are worried about not being able to wear it long enough. For me, I got my normal size and feel like I won’t have a problem fitting into it for months to come. It’s also breastfeeding friendly for any mama’s who just delivered since it has functioning buttons. 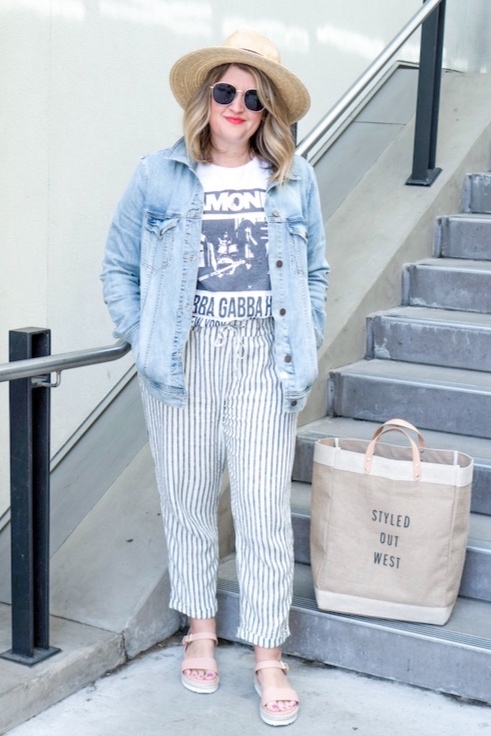 Cortney is also sharing one extra look on her post featuring a look that can easily take you from work to happy and anything in between! 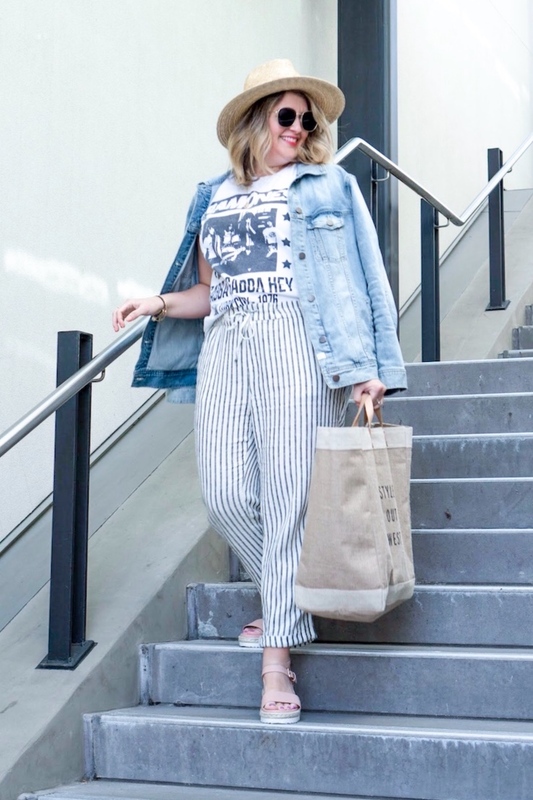 Invest in a good pair of maternity jeans - at a certain point, you will miss wearing jeans so much and won’t be able to stand the thought of wearing anything tight, so opt for ones with a high waisted elastic piece that helps shape your belly and hold you in. But in the first and second trimester, use the belly band as a way to wear your pre-pregnancy jeans - you just fit this over the top of your waistband and you don’t have to button them! It just looks like you’re wearing a tank top underneath. Don’t bother buy maternity tops - just find some cheap tees and tanks at places like Target and size up one. This is a huge money saver and they will be plenty long if you size up one or two. I found this tank for just $5! If you are pregnant while it’s still rather chilly out, then leggings will be your best friend. I haven’t had to buy a pair of maternity leggings yet! Most of mine have been forgiving enough to wear throughout most the pregnancy. I recently splurged on these LuluLemon align leggings because they are not maternity specific so I knew I could wear them after I delivered. They are the comfiest leggings I have ever owned and you almost can’t even tell you have them on! I got the 25” because I’m only 5’5 but you can get an even longer length or the cropped version. You can check out our previous joint post dishing out answers to all your pregnancy questions, in our pregnancy Q&A post! Hope you all are having a great week! The hubs and I are heading to Walla Walla this weekend to get away and enjoy some adult time with friends that live there. We have never been so we are excited to explore - we have heard about things about this awesome town and it’s known as a little Washington wine country!